Research studies have shown that the surface resistivity (SR) test (AASHTO TP 95) is a promising alternative to the RCPT. (See references 3,6,8, and 9.) Recently, some agencies have shown interest in replacing the RCPT with the SR test and have started implementation efforts. (3,8) However, none of the studies have included high-volume fly ash (HVFA) mixtures or mixtures containing fly ash and fine limestone powder. The purpose of this study was to investigate the correlation of the SR test with the widely used RCPT in evaluating concretes’ ability to resist chloride penetration, including HVFA mixtures. In this study, a total of 25 concrete mixtures were prepared. They covered a variety of mix designs, including plain portland cement mixtures (Type I/II cement), fly ash mixtures (Class F and Class C fly ashes), and ternary mixtures containing HVFA and fine limestone powder (0.3 mil). The water-to-binder ratio varied from 0.37 to 0.50, and the cementitious content varied from 423 to 643 lb/yd3. Natural sand with specific gravity of 2.61, absorption of 1.1 percent, and fineness modulus of 2.76 was used. Different coarse aggregates were used, including gravel, limestone, granite, and diabase, with maximum size varying from ¾ to 1½ inches. Table 1 shows the mixture proportions of the plain portland cement mixtures with different cement content, water-to-cement ratios, and aggregate types and gradation. In the mixture ID, the first number represents the AASHTO M 43 aggregate size designation (size numbers 57, 67, and 467), the following letter represents the type of aggregate (L for limestone, DB for diabase, and GV for gravel), and the last number represents the water-to-cement ratio. (10) For example, mixture 57DB47 is a mixture with a No. 57 diabase and a 0.47 water-to-cement ratio. Table 1. Mixture proportions of plain portland cement mixtures. – Admixture was not used. Table 2 shows the mixture proportions of the binary and ternary mixtures. In the mixture ID, PC stands for Type I/II portland cement, F for Class F fly ash, C for Class C fly ash, and L for fine limestone powder (0.3 mil), which was used as a portland cement replacement. The number preceding the letters represents the percentage of that material in relation to the total mass of cementitious material. For example, mixture 68PC23F9L is a mixture that contains 68 percent portland cement, 23 percent Class F fly ash, and 9 percent fine limestone on a mass basis. Table 2. Mixture proportions of binary and ternary mixtures. W/CM = Water-to-cementitious materials ratio. Note: The nominal maximum size of all coarse aggregate was 0.75 inches. Mixtures were prepared and cast following ASTM C192. (11) A minimum of six cylinders were cast, three for 28-day compressive strength tests and three for SR tests as well as RCPT. In some cases, three extra specimens were cast for testing at different ages. Specimens were protected from moisture loss for the first 24 h, then demolded, placed in a standard lime water tank, and cured at 73 ±3 °F until tested. Slump tests (ASTM C143/143M), air content tests (ASTM C231/C231M), unit weight tests (ASTM C138), 28-day compressive strength tests (ASTM C39/C39M), SR tests (AASHTO TP 95), and RCPT (ASTM C1202) were carried out. (See references 2, 9, and 12–15.) SR tests and RCPT were carried out by a single operator. A four-point Wenner probe with 1.5-inch probe spacing was used for the SR tests (see figure 1). A total of eight readings per specimen were taken. The readings were averaged and a correction factor of 1.1 was applied to take into account the lime water curing condition. Figure 1. Photo. SR test using a four-point Wenner probe. Immediately after the SR test, the specimens were cut, prepared, and tested according to ASTM C1202, so the same specimen was used for both the SR test and the RCPT. The SR test was carried out at 28 days on plain mixtures and at 56 days on binary and ternary mixtures. In a few cases, binary and ternary mixtures were also tested at 28 days. Table 3 shows the fresh property test results and 28-day compressive strength of all the mixtures. The mixtures presented a wide range of results; slump varied from 0.25 to 7.5 inches, air content varied from 2.6 to 7.9 percent, and compressive strength varied from 1,730 to 7,860 lbf/in2. Table 3. Fresh properties and compressive strength results. Figure 2 shows the relationship between the SR test and the RCPT, where each point represents the average of three tests. According to Broomfield and Millard and Gowers and Millard, the maximum size of the aggregate should not exceed 1 inch for the probe spacing used in this study (1.5 inches), but there were three mixtures with a 1.5-inch maximum size. (16,17) Nonetheless, these mixtures followed the trend of the other mixtures, and the overall correlation between the two tests resulted in a best-fit line with an R2 of 0.92. If supplementary cementitious materials other than fly ash or admixtures that could affect the electrical conductance are used, this regression line should not be used without validation. Figure 2. Graph. Relationship between SR test and RCPT. The SR tests were easier and faster to run and presented lower variability than the RCPT. The coefficient of variation (COV) of the SR tests ranged from 0.9 to 14.9 percent with an average of 5.3 percent, and the COV of the RCPT varied from 2.9 to 19.3 percent with an average of 10.0 percent. The SR test results ranged from about 6 to about 29 kohm-cm, and the RCPT results ranged from about 1,160 to 12,000 C, which represent mixtures with low to high chloride ion penetrability. Table 4 shows how AASHTO TP 95 and ASTM C1202 classify mixtures by chloride penetrability, depending on resistivity or charge passed, respectively. (2,9) According to the ASTM C1202 criterion, 7 of the 33 sets of tests were classified as low penetrability (< 2,000 C), 20 sets as moderate penetrability (2,000–4,000 C), and 6 sets as high penetrability (> 4,000 C). According to the AASHTO TP 95 criterion, 5 sets were classified as low penetrability (21–37 kohm-cm), 20 sets as moderate penetrability (12–21 kohm-cm), and 8 sets as high penetrability (< 12 kohm-cm). Table 4. Chloride penetrability classification. The shaded areas in figure 2 represent the combination of these classifications. Points within the shaded areas receive the same classification by both standards. There were only four points outside of the shaded areas, and they were classified with a higher penetrability by the AASHTO TP 95 criterion than by the ASTM C1202 criterion, indicating that the AASHTO TP 95 classification is more conservative. Figure 3. Graph. Correlation between SR test and RCPT obtained in different studies. As shown, the curve obtained in this study is in agreement with the curve obtained by Chini et al. (6) However, the Rupnow and Icenogle curve yields up to 40 percent lower Coulomb values for resistivities less than 15 kohm-cm. (3) For resistivities of about 15 kohm-cm and higher, the difference between this study’s curve and the Rupnow and Icenogle curve is negligible. Twenty-five plain, binary, and ternary mixtures containing up to 55 percent class F or class C fly ash and, in some cases, fine limestone powder and with different aggregate types and maximum sizes were used to evaluate the correlation between the RCPT and the SR test. The results show that the SR test results are highly correlated with the RCPT even for HVFA mixtures and ternary mixtures with finely ground limestone, and a correlation curve was proposed. The SR test was easier and faster to run compared to the RCPT and did not require any specimen preparation. It also presented lower variability than the RCPT. AASHTO T 277 (2007). Standard Method of Test for Electrical Indication of Concrete’s Ability to Resist Chloride Ion Penetration, American Association of State Highway and Transportation Officials, Washington, DC. ASTM C1202 (2010). Standard Test Method for Electrical Indication of Concrete’s Ability to Resist Chloride Ion Penetration, ASTM International, West Conshohocken, PA.
Rupnow, T. and Icenogle, P. (2012). “Evaluation of Surface Resistivity Measurements as an Alternative to the Rapid Chloride Permeability Test for Quality Assurance and Acceptance.” TRB 91st Annual Meeting,Transportation Research Board, Washington, DC. Hoppe, E., Lundy, L., and Schinkel, T. (2007). Implementation of an Automated Test Setup for Measuring Electrical Conductance of Concrete, Report No. FHWA/VTRC 07-R21, Virginia Transportation Research Council, Charlottesville, VA.
Ontario Ministry of Transportation (2008). “Material Specification for Concrete—Materials and Production.” Ontario Provincial Standard Specification, OPSS.MUNI 1350, Toronto, ON. Chini, A., Muszynski, L., and Hicks, J. (2003). Determination of Acceptance Permeability Characteristics for Performance-Related Specifications for Portland Cement Concrete, Report No. BC 354-41, Florida Department of Transportation, Tallahassee, FL. Obla, K. and Lobo, C. (2007). “Acceptance Criteria for Durability Tests: Minimizing the Risks of Accepting Defective Concrete or Rejecting Acceptable Concrete.” Concrete International, Vol. 29, Issue 5, American Concrete Institute, Farmington Hills, MI. Kessler, R., Powers, R., Vivas, E., Paredes, M., and Virmani, Y. (2008). “Surface Resistivity as an Indicator of Concrete Chloride Penetration Resistance.” Presented at the 2008 Concrete Bridge Conference, St. Louis, MO. AASHTO TP 95 (2011). 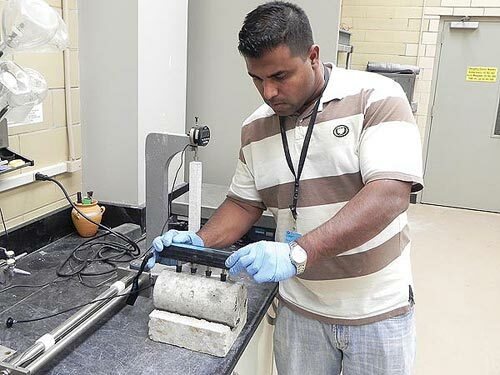 Standard Method of Test for Surface Resistivity of Concrete’s Ability to Resist Chloride Ion Penetration, American Association of State Highway and Transportation Officials, Washington, DC. AASHTO M 43 (2005). Standard Specification for Sizes of Aggregate for Road and Bridge Construction, American Association of State Highway and Transportation Officials, Washington, DC. ASTM C192 (2007). Standard Practice for Making and Curing Concrete Test Specimens in the Laboratory, ASTM International, West Conshohocken, PA.
ASTM C143/143M (2010). Standard Test Method for Slump of Hydraulic-Cement Concrete, ASTM International, West Conshohocken, PA.
ASTM C231/C231M (2010). Standard Test Method for Air Content of Freshly Mixed Concrete by the Pressure Method, ASTM International, West Conshohocken, PA.
ASTM C138 (2009). Standard Test Method for Density (Unit Weight), Yield, and Air Content (Gravimetric) of Concrete, ASTM International, West Conshohocken, PA.
ASTM C39/39M (2009). Standard Test Method for Compressive Strength of Cylindrical Concrete Specimens, ASTM International, West Conshohocken, PA.
Broomfield, J. and Millard, S. (2002). “Measuring Concrete Resistivity to Assess Corrosion Rates.” Current Practice Sheet 128, The Concrete Society, Surrey, UK. Gowers, K. and Millard, S. (1999). “Measurement of Concrete Resistivity for Assessment of Corrosion Severity of Steel Using Wenner Technique.” ACI Materials Journal, Vol. 96, Issue 5, American Concrete Institute, Farmington Hills, MI. Researchers—Jussara Tanesi, Ph.D. and Ahmad Ardani, P.E. at the Federal Highway Administration (FHWA) Turner-Fairbank Highway Research Center. For additional information, contact Mr. Ardani at (202) 493-3422 or through the FHWA Office of Infrastructure Research and Development located at 6300 Georgetown Pike, McLean, VA, 22101-2296. Availability—This TechBrief may be obtained from the FHWA Product Distribution Center by email to report.center@dot.gov, fax to (814) 239-2156, phone to (814) 239-1160, or online at https://www.fhwa.dot.gov/research. Key Words—Surface resistivity (SR test), Chloride penetration/permeability test (RCPT).